The first problem in dealing with the subject of Huscarls is to decide whether you are looking at the traditional meaning of the word in Old Norse, or whether you are talking about the English military term. In Old Norse the term Huscarl is just a word meaning a household servant - house-karl - and could be applied to anyone who served a lord in his household. 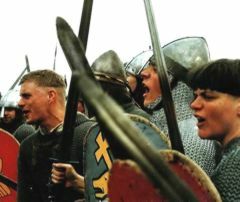 In Old English it has a meaning nearer to the later medieval idea of 'Household Troops', the highly trained soldier who served a particular lord and his family or household. Certainly by the later eleventh century, the Norse usage of the word was similar to that of the English, although earlier on it had had a more general meaning. For the purposes of this article we will be looking at the English Huscarls. There is little doubt that Huscarls were introduced into England during the reign of Cnut (although there is some evidence for an elite mercenary force during Aethelred's reign). An institution similar to the Huscarls had existed in Scandinavia for some time, and it is possible that Cnut was trying to 'standardise' that aspect of all his empire. It is also possible that tales of the Varangian Guard in Byzantium inspired the formation of the Huscarls as the King's bodyguard. According to Sveno, Cnut re-organised his army in 1018 and proclaimed that only those 'who bore a two-edged sword with gold inlaid hilt' would be admitted into his chosen guard. It is said that wealthy warriors made such haste to get swords of the right quality that the sound of the sword-smiths' hammers was heard throughout the land. It may be that Cnut was trying to get some Englishmen into his elite guard to aid the unification between Englishmen and Danes. Whatever the reason, it can be seen that this would have given Cnut the chance to get some of the best warriors in the land into his personal guard. How was this guard organised? Many of the writers earlier this century thought that the Huscarls were organised in a similar way to the Jomsvikings. However, more recent research suggests that the Jomsvikings may never have existed as the disciplined guild of warriors portrayed in the sagas. What is certain, however, is that Huscarls were paid troops with their own rules of justice and discipline, answerable directly to the King (or later some of the more powerful Eorls who had their own Huscarls). Most of the Huscarls lived at the King's court and served him directly. By the time of Edward the Confessor some Huscarls had been given estates by the king, varying in size from half a hide to fifteen hides, with an average being 4 hides, although these were probably the exception rather than the rule. Traditionally, the Huscarls 'contract' to the King was renewed on New Year's Day, and any Huscarl was free to leave the king's service. It is also clear that problems of internal discipline were dealt with by a meeting of the Huscarls. The worst sentence was to be declared 'niðing' (a Norse word meaning coward or craven) and cast out of the Huscarls. It is possible that Eorl Swein, Harold's brother, had been a Huscarl since when he abducted the abbess of Leominster and killed his cousin Beorn, he was not tried by a Witan and outlawed, the king and the army declared Swein 'niðing', suggesting military, not civil, justice. The exact details of the 'guild laws' for the Huscarls are now not as certain as they were once thought to be, since the principle sources for these laws have been shown to be dubious. However, the existing evidence is strong enough to be sure that the Huscarls did have their own 'guild-laws' by which they lived, based on loyalty to the king and an oath of true loyalty to the other Huscarls, just as the thegns of Cambridge did in the early eleventh century and the 'peace guild' of London did during Aethelstan's reign. The royal Huscarls are thought to have numbered about 3000, a vast number of men to pay and, as a consequence, a special tax of one mark of silver from ten hides was levied to pay the Huscarls. In addition to their pay in coin (thought to have been paid once per month), they were housed and fed at the king's expense. It is not certain whether the king also paid for their arms and armour, although it is likely they were expected to supply these themselves (arms and armour may have been given as gifts in return for good service too). Obviously, they would equip themselves with the best arms and armour they could, not only because their lives depended on it (literally), but also because the king could dismiss them, removing their livelihood too, if their war gear was not 'up to scratch'. If they were to constitute the core of the army, their war-gear had to be the best available. In addition to his sword, a huscarl would also have been expected to have a horse to carry him to the battle (although he would dismount and fight on foot), a mail-shirt, helmet, shield, spear, and, of course, the 'massive and bloodthirsty two handed axe'. That Huscarls were valued servants of the king is bourne out by an event in 1041. Two of Harthacnut's huscarls were killed by the citizens of Worcester whilst collecting a particularly unpopular tax. Harthacnut decided to ravage the entire shire by dispatching the forces of five eorls and 'almost all his huscarls' to teach his subjects a lesson in obedience. This also gives us a hint to the fact that a huscarl's duty to the king was not limited to fighting. Like the thegns, the huscarls served the king in peace as well as war. They appear as tax collectors, witnesses to royal charters, recipients of land grants and donors of land. Often the same man is found described in charters as cynges huskarl and minister regis. If the huscarl's duty was purely military he would have been described as milites regis not minister regis. Huscarls could best be described as ministers and attendants upon the king (or eorl) who specialised in, but were not limited to, war. Their obligation to serve in arms arose from the lordship bond rather than the cash inducement. In this way they probably differed from their contemporaries, the lithsmen and butecarles who were purely mercenary troops and seem to have sided with the highest bidder. What happened to the Huscarls? The huscarls probably formed the spear head of any army right up until the Conquest. After the Conquest the huscarls seem to have completely disappeared. Why was this? Certainly the vast majority died on Senlac ridge, fighting around the king, but not all. Most of those that did survive, along with many of King Harold's thegns, and some of the eorl's huscarls seem to have crossed to the continent as mercenary troops. Many of these made it as far as Byzantium and became members of the Varangian Guard, so much so that, by the twelfth century, the Varangian Guard was sometimes referred to as 'the English Guard'. Abels, R.P. - Lordship and Military Obligation in Anglo-Saxon England. Hollister, C.W. 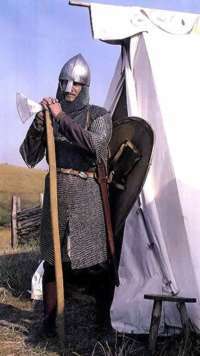 - Anglo-Saxon Military Organisations. Larson, L.M. - The King's Household in Anglo-Saxon England. Stenton, F. - Anglo-Saxon England. The Anglo-Saxon Fyrd c.400 - 878 A.D.. The Anglo-Saxon Fyrd 878 - 1066 A.D..
Last updated 28 March, 2005. Article by Ben Levick 1992.